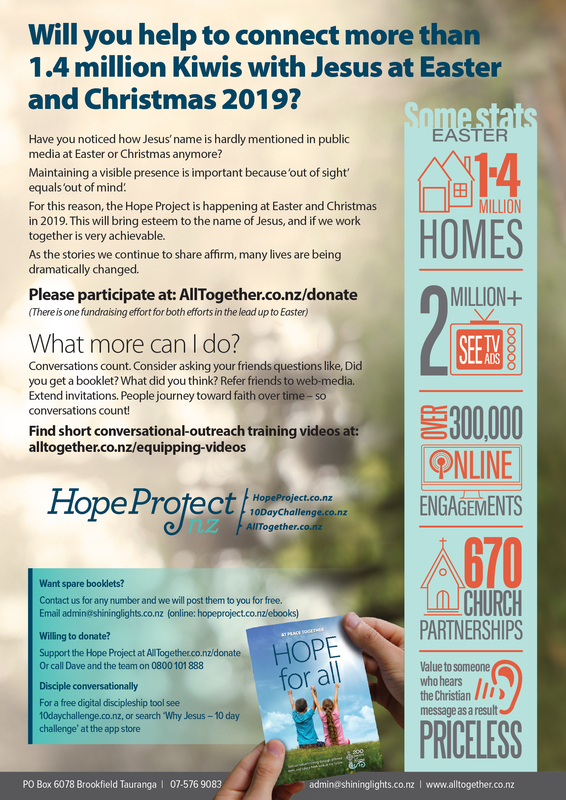 (iii) Hope Project Family – highlighting what Kiwi churches are doing for families from 2020 onwards. This kind of national voice can only exist if the Kiwi Church will unite in the view that it is needed. Your partnership is requested. A conversation is in process in our natoin about the place of Christianity within our nation. 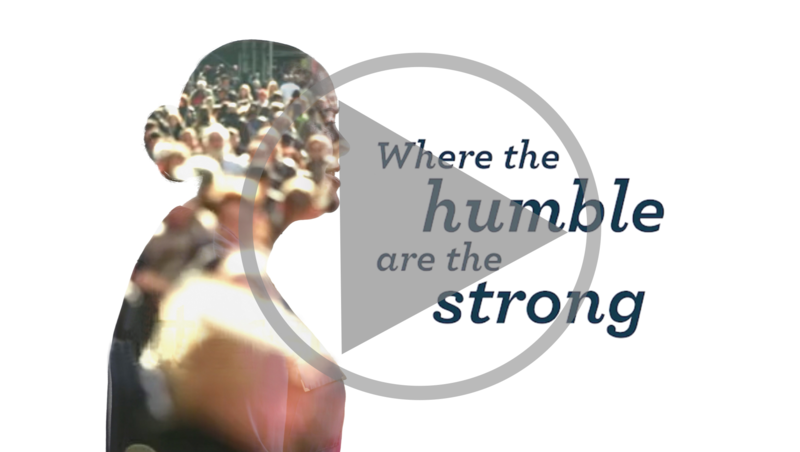 We are legitimately a ‘Christian’ nation – if that is measured by our history and values. however, Kiwis are currently denied access to the history that validates this, and are thus unaware. Christianity is being removed from the public square. If we do not engage the public conversation in the manner with which it is taking place, this will trend continue. Together, this is very achievable. As individuals, subscribe for prayer updates at the bottom of the homepage. 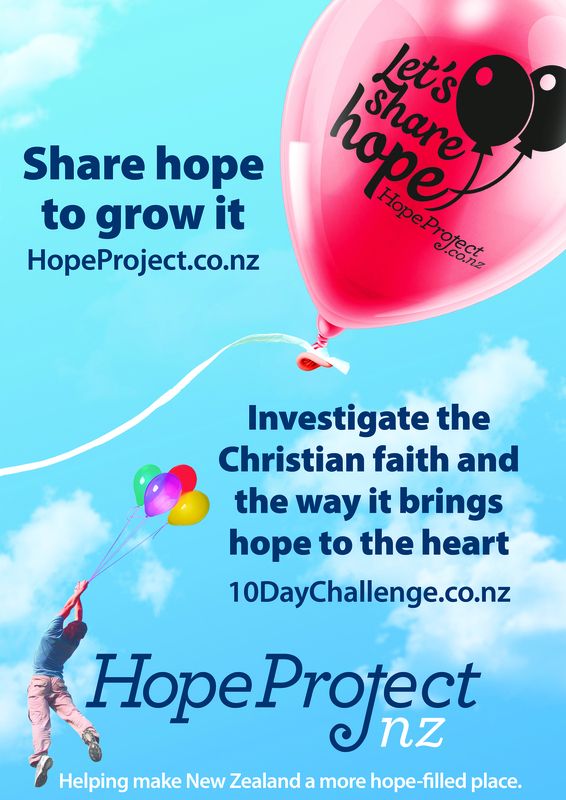 As churches, subscribe for the pastors updates at the bottom of the homepage – and we will then consider you a ‘partnering’ churches, and add your church to the ‘find a church’ map at 10DayChallenge.co.nz. (There is no ‘subscription’ fee, and donations always remain voluntary). 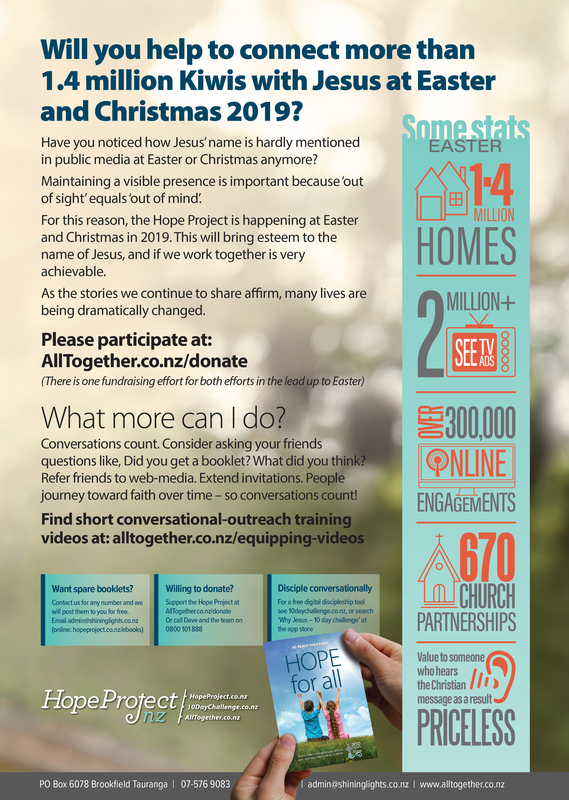 A CHRISTIAN PROMOTION: Each effort will continue to also communicate an aspect of Christian belief, thinking and hope that are relevant to the stories, as well as the core Christian message of God’s love shown through Christ. RECEPTIVITY: New Zealanders have warmed to these projects. You will find a recent report in the right-hand column of this webpage. 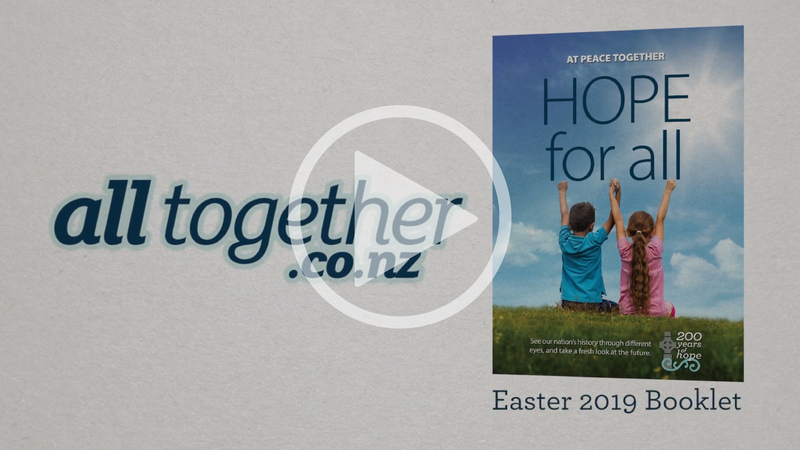 2 primary equipping resources to equip members in ‘partnering’ churches. (1) Equipping videos on conversational skills here, and (2) 4-week sermon series about the mission of the Church (message outlines + small group guides) found here. 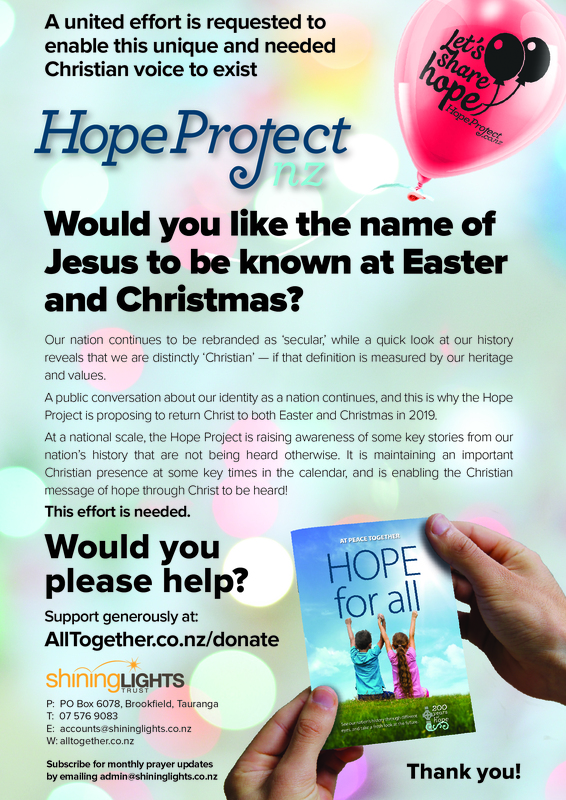 A vital part of each Hope Project campaign provides high-quality, multi-page booklets to every New Zealand household. Having done this four time to date, you can view a draft copy of booklet 5 here. Working all together the Kiwi Church can have this voice! If insufficient is raised for Christmas, we forgo that public presence in that year. 2020: We hope to add ‘Hope Project – family’ – with a total budget of $1m. Too much? 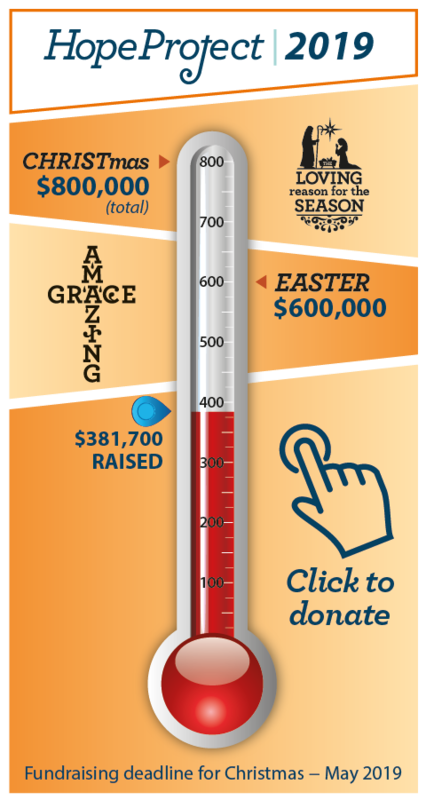 Kiwi churches donate approx $170,000,000 per year just for the privilege of having pastors (without considering administrators, youth workers or other roles). The amounts are a question of value. 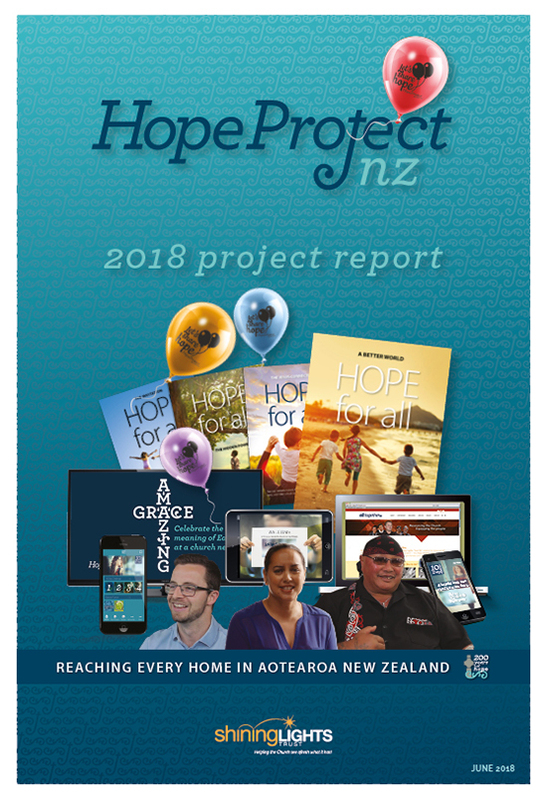 Please see the Hope Project 2018 Report for more details. 2019 Church marketing material below. 2019 Promo Videos – 1 minute or 30 second.